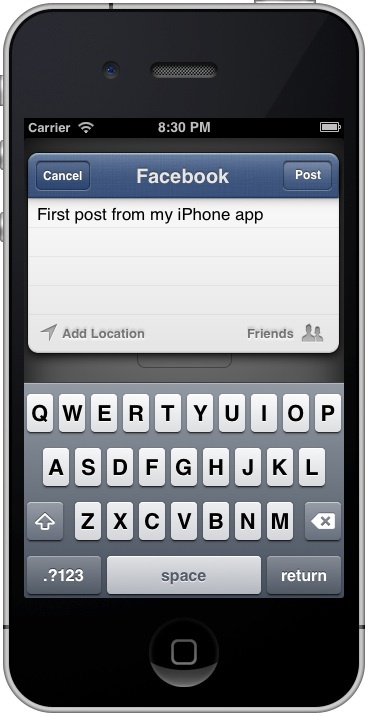 Following the Twitter support in iOS 5, Apple added the support of Facebook in iOS 6. 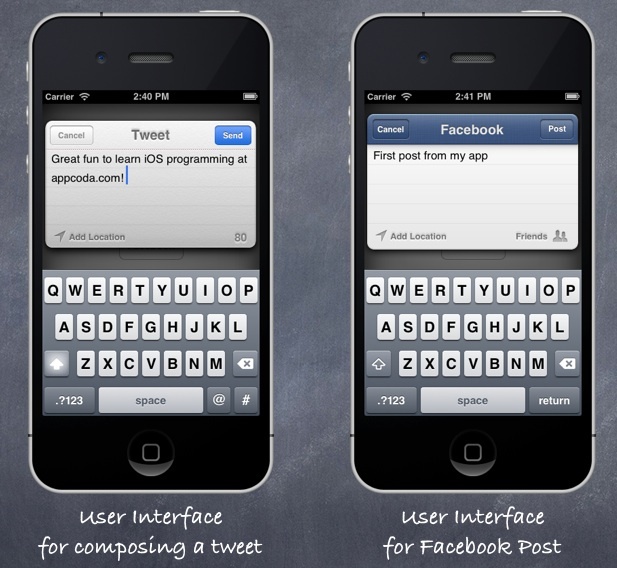 In the past, developers have to make use of the Facebook and Twitter API to integrate the sharing feature in their apps. 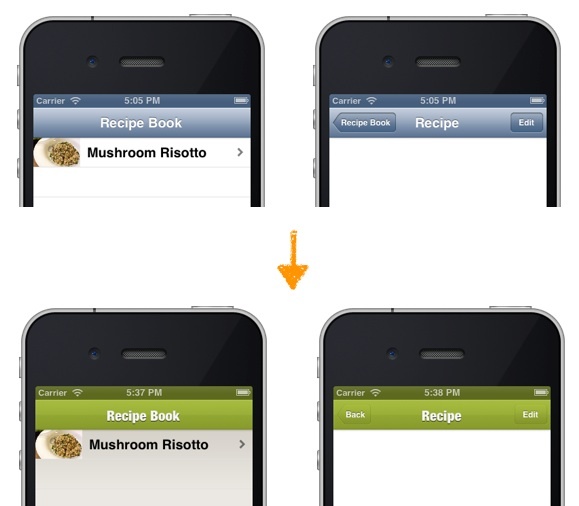 With the built-in support, it’s much easier to add these social features to your own app. In this short tutorial, we will show you how to build Twitter and Facebook sharing feature in your app. As usual, we’ll build a simple app together as we believe there is no better way to teach programming than “get your hand dirty”. The iOS 6 introduces a new framework known as the “Social Framework”. The Social framework lets you integrate your app with any supported social networking services. Presently, it supports Facebook, Twitter and Sina Weibo. The framework gives you a standard interface to interact with different social networks and it shields you from learning the internals. 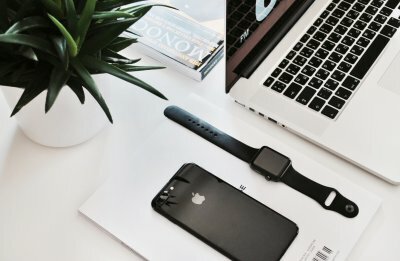 You don’t have to worry about the Twitter/Facebook APIs, how to handle network connection, handle single sign-on, etc. The social framework simplifies everything. You just need to write a few lines of code to bring up the composer and users can tweet / publish Facebook post within your app. The framework comes with a very handy class named SLComposeViewController. The SLComposeViewController class presents a standard view controller for users to compose tweet or Facebook post. 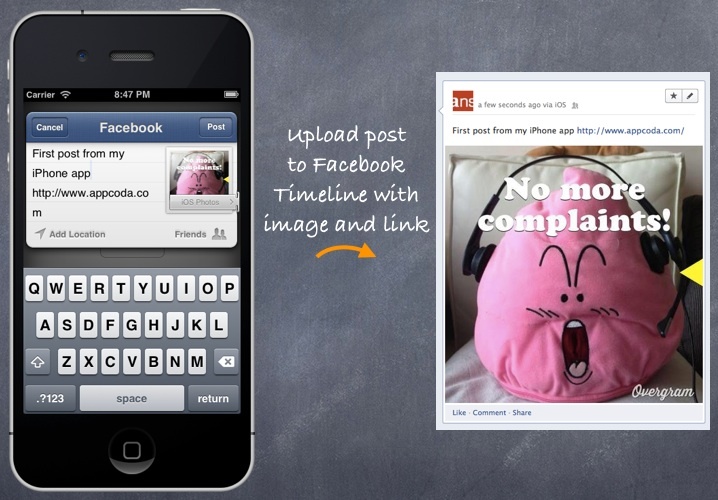 It also allows developers to preset the initial text, attach images and add URL to the post. If you just want to implement simple sharing feature, this is the only class you need to know and that we will go through today. Now you should have a basic idea about the framework. 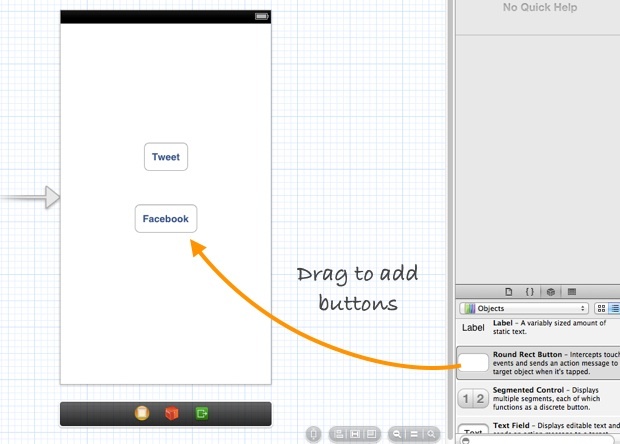 Let’s get started and build a simple app with Twitter and Facebook integration. 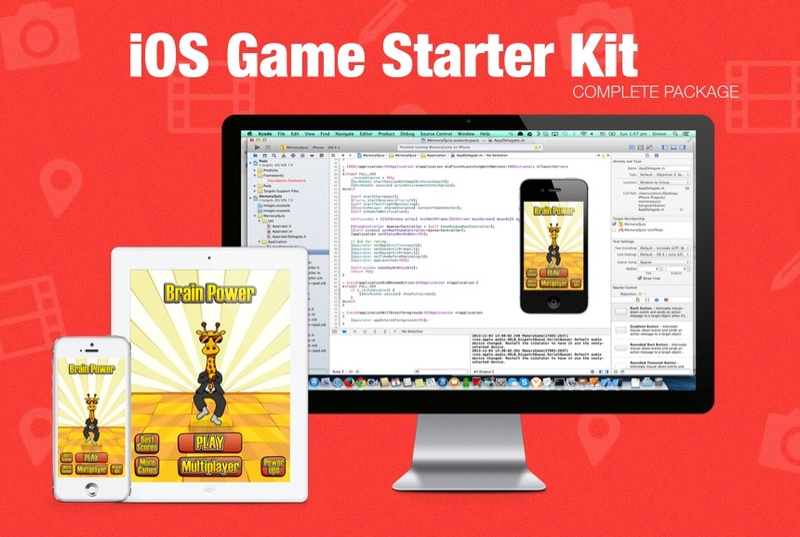 As you need to use iOS 6 for this tutorial, please upgrade your Xcode to v4.5 or up before proceeding. Once you’ve successfully created your project, go to the Storyboard and design the user interface. In the view, add two buttons. Name one as “Tweet” and the other one as “Facebook”. 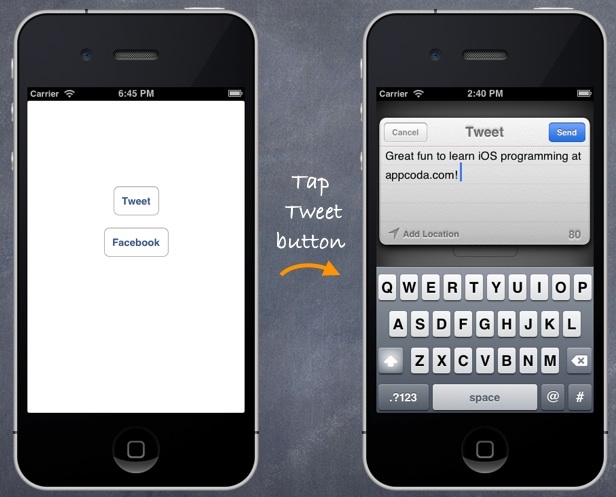 Press and hold the control key, click the “Tweet” button and drag it towards the “SocialSharingViewController.h”. Create an action method and name it as “postToTwitter”. This method will be invoked when the button detects a Touch Up Inside event. Before we move on, let’s take a look at the above code line by line. Line #2 – Firstly, we use the “isAvailableForServiceType” method to verify if the Twitter service is accessible. One reason why users can’t access the Twitter service is that they haven’t logged on the service in the iOS. Line #4 – If the service is accessible, we then create an instance of the SLComposeViewController for the Twitter service. Line #5 – We set the initial text in the composer. 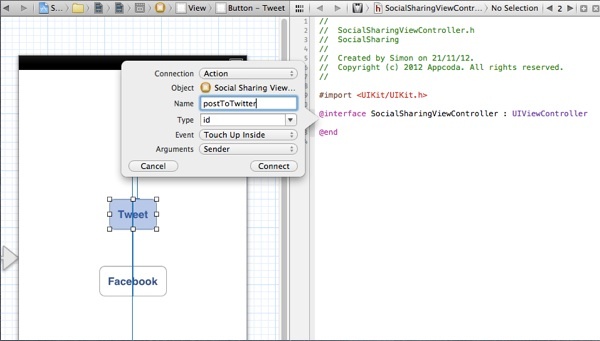 Line #6 – Finally, we invoke presentViewController:tweetSheet to bring up the Twitter composer. That’s the code we need to let user tweet within your own app. It’s much easier than you thought, right? But we still miss one thing before the app can be run. By default, the Social framework is not included in the Xcode project. To compile the app properly, add the “Social.framework” in the project. 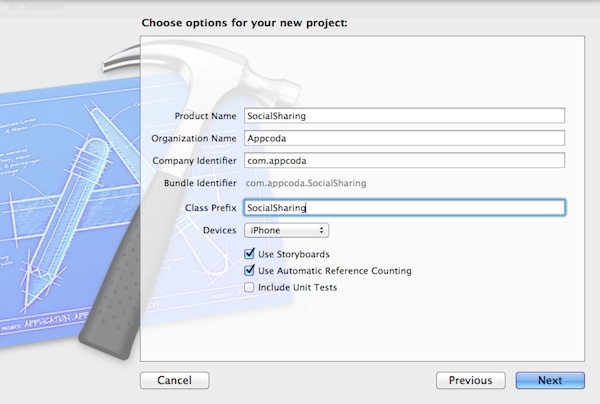 In the Project Navigator, select the “SocialSharing” project. In the Content Area, select “SocialSharing” under Targets and click “Build Phases”. Expand “Link Binary with Libraries” and click the “+” button to add the “Social.framework”. In case you haven’t registered your Twitter account in the Simulator, you’ll end up with the below. Just go to Settings -> Twitter and sign on with your Twitter account. That’s it. The code is very similar to the code we’ve used in the “postToTwitter” method. The only change is the service type. Instead of using SLServiceTypeTwitter, we tell SLComposeViewController to use SLServiceTypeFacebook. Let’s run the app again and click the “Facebook” button. Your app should bring up the composer for publishing Facebook post. Wouldn’t be great to upload your post with image and link? The SLComposeViewController comes with some built-in methods to allow you easily do the upload. Let’s tweak the code of the Facebook button and make the upload work. You can simply use the “addImage” method to attach an image and the “addURL” method to include a link. Go ahead to run the app and test out the Facebook feature again. You should see a thumbnail and a link bundled in the post. As you can see from this tutorial, it’s pretty easy to add Twitter and Facebook feature using the Social Framework in iOS 6. If you’re building your app, there is no reason why you shouldn’t incorporate the social features. With Twitter and Facebook support, it adds values to your app and may boost its popularity. The tutorial introduces the basics of Facebook and Twitter integration. You can try to tweak the demo app and upload multiple images to the social networks. However, if you want to access more advanced features such as display users’ Facebook friends, you’ll need to study the Facebook API. I hope you enjoy the tutorial and you have a better understanding about the social framework. Feel free to leave your questions and share your thought about the tutorial. do you know to implement the facebook like button? It was very easy to understand but I faced one problem. In case of facebook if user has not logged in through twitter it does not redirects to settings so that user can login. The setting button actually takes us back to first screen. Great tutorial. Is there anyway to show a Facebook sample on how to post multiple images to the same wall post? When i click on the button Facebook, he show nothing, but the twitter button work perfect. Does it show any error in console? I need to display my app name in place of ios how can it be done ?? Did you got any solution ??? I’m trying the sharing to facebook part for my app. It’ll work if the app is on my iPhone. I’m using the simulator now and I think may need to have more code for facebook login. I’m checking with the facebook sdk tutorial now. How we can hide the keyboard in both facebook and twitter post window. Twitter limit of 140 characters per tweet. It becomes extremely hard especially when try to share a big tweet. Is there any way to Tweet More Than 140 Characters? Neither the image or the link is showing up? Help! Will any image work or does it need to sized to fit? Ok, scratch that…still not working. Help! When I tapped on the button Facebook, it didn’t show anything without any error message, but the twitter button work perfect. When I tested this on simulator it’s works fine but not on my device(iphone 4). Pleas tell me the reason why it happens…. What version of iOS are you using on iPhone? Facebook sharing only works on iOS 6 (or up). Did you ever solve this problem..i have the same issue..twitter is fine in the simulator but wont work on the phone !! !…aaaagh…driving me mad..any help you have would be awesome. If you set the deployment target under iOS 6, then uncheck “Autolayout” in “the file inspector” of the storyboard. This is great in the simulator but wont work on my Iphone running 6.1..any ideas..
why this message keeps appearing to me? 2013-06-25 11:50:39.885 app[1255:19703] Warning: Attempt to present on whose view is not in the window hierarchy! Facebook sharing do not work in iOS 6.1 🙁 . How to fix this problem ? What’s the error you’re experiencing? Pleas tell me the reason why it happens. Can we add Weibo as well. Why the app doesn’t show up “No Twitter Account” or “No Facebook Account” alert view in iOS simulator??? hi! Question: Is tehere a way to post to FB without promting the user? Could you make a tutorial about that? hi! Question: Is there a way to post to FB without prompting the user? Could you make a tutorial about that? Hi there! This code has been very very useful. Thank you. I have successfully integrated fb and twitter sharing on my photo booth app. However, I am having trouble adding the image that has just been edited and saved to photo library to the tweet/fb post. What should I add in controller addImage:____? Can you help me please? Here is the code just before the (IBAction)postToTwitter:(id)sender code I added >>>. How to show the success message after posting it to twitter/facebook, what is the property/method that we need to refer. Can this be used to post to another user’s wall or to a product page etc..
How can we authenticate facebook from our IPhone application using OAuth Protocol? Some times tweet is failing “Because last one was same as current one.”! How can we track this while using SLComposeViewController? how can i share my current location. but stiil one thing missing plaese attach photo frame select image. Thanks for tut! I have one question – After reviewing Facebook policies, they said not to pre-fill the dialogues while sharing on Facebook. So using this will violets rule!? So just want to clear on is it allowed or not? My image is coming from URL how i can post that image. How can I change “Share on Facebook” self made button into button with Facebook icon image? Is it possible within the social framework, or do I need to download the images from somewhere else and create a custom button with image? can any one tell me! 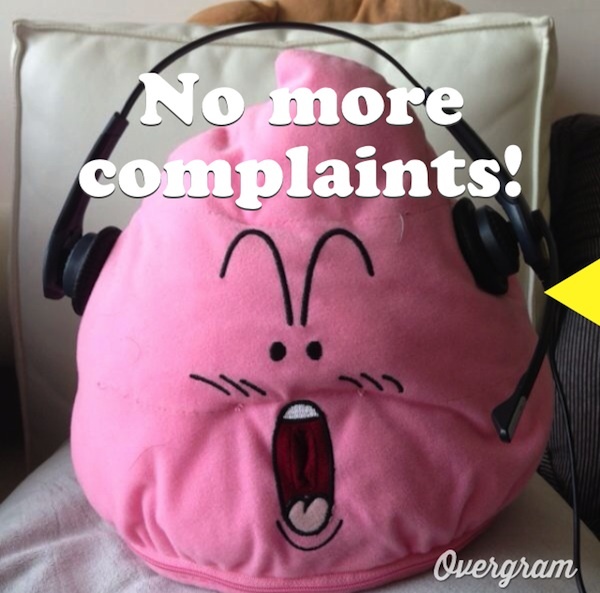 How to post the content of slcomposer without presenting dialog box. I mean click and share, no dialog box. Hi there! I have a matter: when I am using a real device to post a text on Facebook, the setInitialText property does not fill with the text. Did someone solved this ? please help me to.